Share your favorite stories and save big on photo books! This week, create one 20-page 8" x 11" photo book and get two more FREE. Choose three copies of one book or three different books of the same value and save with code LOVE8X11 through September 19th. Offer applies to first 20 pages of photo book only. Must use code LOVE8X11 at checkout to receive two free 8" x 11" photo books when you buy one 8" x 11" photo book. Must have three 8" x 11" photo books in cart to receive the discount. Photos may differ but all three 8" x 11" photo books must have the same cover type and base price. 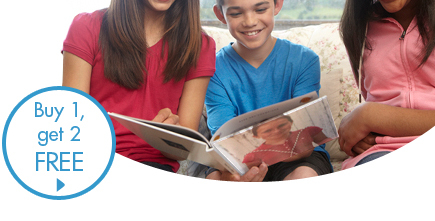 Disney themed photo book designs and Snapfish professionally designed photo books are excluded from the offer.